Now, before we talk about this, I first want to say that I don't actually condone real violence. Now that we've got that out of the way, though, I will proceed. You know, sometimes people make you angry, and sometimes subscribing them to a stack of ferret clothing catalogs doesn't quite scratch the retaliatory itch. I know. Believe me, I do. There have been plenty of times I have wished I believed voodoo dolls actually worked. I think rather than sticking someone's voodoo doll with pins, I would use them to make people do really awkward dances in the middle of very important presentations or promising first dates. In lieu of an effective voodoo doll, though, I have come up with an idea I think may really strike everyone's fancy. 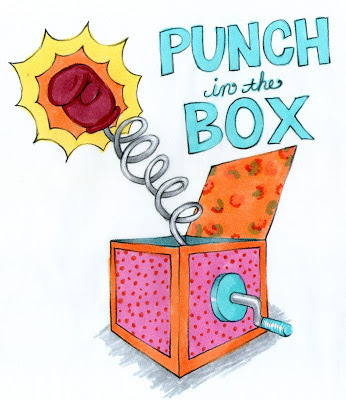 It's called the Punch in the Box. Basically, the punch in the box would really solve all of your aggression problems without causing too much real bodily harm. The whole thing would be operated via delivery service, and you'd be able to order it online. You can send it anonymously or with a personalized message and signature. Whatever would suit your fancy. Then, you'd have the package delivered to the person deserving such a gift. "Oh! I've gotten a package!" your nemesis will say, thinking that of course they are so loved that someone would certainly send them a gift at work or home...but work really does seem better. They'll open the shipping box to find a beautifully wrapped gift inside. "What could this be!?" Then, the deserving party will unwrap their gift to find a festively decorated jack-in-the-box. "How droll," they'll think, maybe having a little giggle to themselves. Unable to resist, they'll begin to turn the crank, hearing the Mr. Softee song or some such nonsense. The suspense will rise, and they'll be starting to get a little nervous, when BAM! That's not a puppet! It's a spring-loaded boxing glove RIGHT IN THEIR FACE. Of course, it's important to note that it's just spring loaded in a little box, so it probably wouldn't actually hurt them, but I think it'd get the message across. And if you're worried that they might miss your meaning, there's always the personalized message where you can say things like, "a much-deserved gift for you," or, "you're the worst," or, "I'm surprised this hasn't happened sooner," or "Please use several times to achieve the desired effect." The possibilities are endless, really. So, if any of my readers out there are product developers, please, let me know when this thing gets made. I'm pretty sure it'd be a gold mine.